Now wait just a minute. Before you resign yourself to the images of gloppy, slimy picnic bean salads sitting in their plastic take-out bowls and swimming in oil and vinegar, I have to tell you that it doesn't have to be like that. And, even though I have been known to go on and on about the virtues of dried beans, just so you know I am not, in fact, one of those people who insists on the long way every time. My first preference will always be for the dried variety, but if it's the difference between buying a tub of lackluster bean salad or making it quickly and efficiently yourself, I'll take the latter. Plus, and this is a big plus, it's summer. And while summer means tanned skin, runs in the park in shorts instead of those awful tights, actual foliage and generally happy people (can you tell it's actually still spring and the oppressive heat of a NYC summer hasn't hit me yet?) it leaves almost no room for running the burners for hours and hours on end. No room at all. 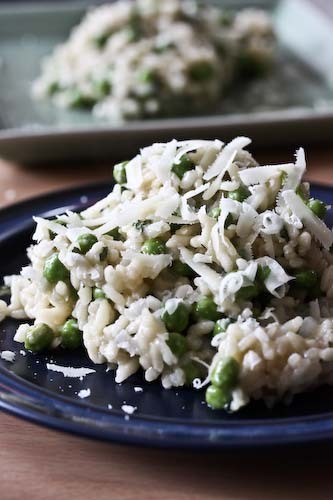 This recipe comes from Angela Tunner's Simply Summer, about which I've written before. She gives you many great tips on keeping cool this summer, along with this very respectable bean salad. Which is quite good as written, but I like to think I made it even a little bit better. And the secret? Lemon juice. Maybe you won't need the extra acid kick, but I'm an acid fiend. I love my vinegars and my lemon juices. I love them by themselves or together. And I love them as the brightest finishing note in almost any recipe, that final, dazzling, perfect chord. But especially in a summer salad. However. Before you go and start adding extra lemon juice or extra vinegar, taste. Salads like this are all up to personal preference, so add more or subtract as you like. Basically this is a dump and mix recipe (of the highest order, of course!). Drain the beans and rinse them off in a colander so you get rid of all that slimy stuff they're canned in. Then put them in a bowl and add the rest of the ingredients. Since canned beans aren't as sturdy as dried, be careful while you mix so as not to break up the beans. Squirt with a little lemon juice if you'd like before serving. 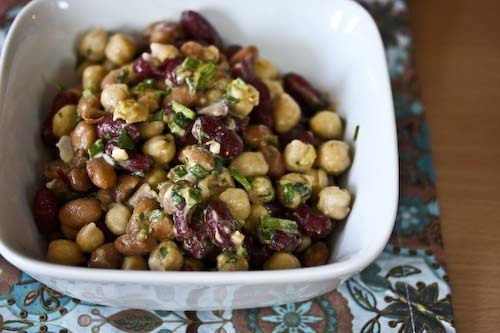 This looks and sounds so similar to the out-of-this-world bean salad at Nepenthe in Big Sur. My Grandmother makes something just like this! My Grandfather and I are the only ones who like it. She adds diced celery and red and green peppers to hers. Its very tasty! I love bean salads. I used to say it was a telltale sign of growing old because when I was a kid I always thought of it being old people food. LOL!! This is really healthy and delicious Andrea. It also very feeling. 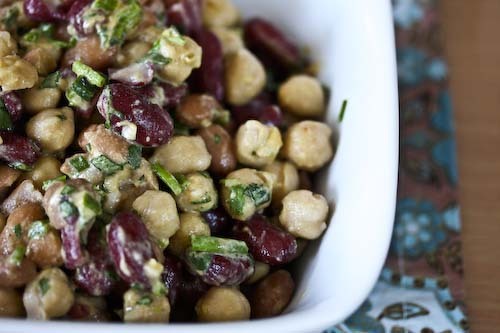 I have been enjoying beans lately and I really like the sound of this bean salad! Sounds and looks healthy and delicious!